We offer Petercem Boiler Burner Controllers which are capable of controlling and monitoring oil burners of capacity 30 kg to 350 kw output. In case of non ignition of the burner, the equipment is automatically brought to interlock position after the safety time. The suitable flame detectors are photocells. These are control and safety equipment for oil burners. These controls are provided with amplifier for flame detection. It utilizes the flame sensor with photo resistant cell models 8209, 8205. Petercem gas burner control unit is also available which can be use with U. V. Detector model 8300. We also do reparing for ECEE MA 810, ECEE MA 150.01, ECEE MA 55. Brahma burner controls / Burner Control Box for gas, oil or dual fuel burners are capable of controlling and monitoring burners of medium to high capacity for non permanent operation with or without fan in the combustion circuit. All these controls perform non-volatile lock-outs, condition from which a restart of the system is only possible by means of manual reset. Their technical and manufacturing characteristics and the variety of models make them suitable for mono bloc burners, hot air generators, steam boilers, kilns, furnaces etc. Classic Enterprises, Mumbai offer oil and gas monobloc burners and spare parts. Siemens burner controller Model: LOA24.171B27 suitable for following make oil burners Ar-co, Bentone, Blowtherm, De Unigas, Ecoflame, Riello, Baltur, Sokook, Weishaupt etc. Honeywell Bunrer controller TMG 740-2 Gas Burner Control is suitable for most types of fully automatic forced and induced draught gas burners. It provides a safe light-up and shut -down sequence for the burner and incorporates pre-purge, ignition and ignition safety time intervals, start gas flame or pilot gas flame , main flame and modulation stages. 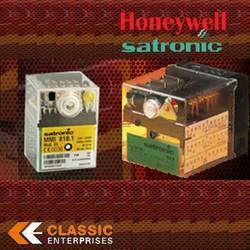 Honeywell control box TMG 740-2 control is suitable for use on UV (Ultra Violet) with the Satronic UVZ 780 flame detector, or flame ionization principals of flame detection. Classic Enterprises, Mumbai Distributors, importer and supplier of SIEMENS Combustion Control Products in India. Classic Enterprises Distributors for SIEMENS Combustion Control Products in India offers all burners and spare parts under one roof. Siemens burner controller/ burner programmer LME 11.330, 220V. Siemens burner controller/ burner programmer LME 21.330, 220V.